January 9, 2007. The day that changed the technology world for good and Apple Inc was the reason behind it. Late Mr. Steve Jobs was ready on stage to deliver his most iconic keynote of his life. Steve was all set to reveal a revolutionary device that would combine, a better screen iPod with touch controls, an internet device and a phone all combined into a one single device. The iPhone. With 3.5 inch screen, 128MB of RAM and 2 Mega Pixel camera (it may not sound much by today's standards) was what you would refer to as an actual modern smartphone. With the introduction of iPhone the bar was raised, not only for cell phones, but in general for all media and tech devices as well and it was just the beginning. A year later iPhone 3G was launched, not much had changed internally, but now it supported 3G data for faster internet, Jobs claimed it was 36% faster than any other 3G based phone in the market at that time. Apple had ditched the Aluminum casing in favor of friendlier polycarbonate one that increased the call reception quality greatly. Later in WWDC the 3Gs was launched, which had double the RAM, larger battery, and twice as fast cellular data connection going to peak speed of 7.2 Mbps. With more than 50000 apps to take advantage of all these revolutionary feature this new smartphone by Apple was instantly loved by the crowd. The subsequent iPhone 4 was a big step forward, this Apple smartphone would introduce the dawn of high density displays termed as "Retina Display". With each new iteration iPhone 4s, 5, 5c, 5s, 6 and now 6s, this amazing device just got more faster, more smarter and more better and loved by more and more people all over the world. iPhone 6: - If you want a well-executed smartphone, leave it to the Apple. The iPhone 6 feels like a perfectly crafted sword ready to cut seamlessly through the competition. Powerful A8 processor, 1 GB RAM and PowerVR quad core graphics makes this iPhone a beast on its own, yet it feels sleek and sturdy in your hands. The superior 8MP back camera and 1.2 MP wide angled front facing camera will make sure that neither those toddler walks are missed nor those super awesome group selfies. Comparing it with likes of HTC One M8 and Samsung Galaxy S5, iPhone comes out to the slimmest and lightest of all. Spec wise iPhone 6 may not seem much in front these Android giants but don't be fooled by that, as Apple has always proved to provide top notch performance with meagre specification with their industry leading hardware and software optimizations. 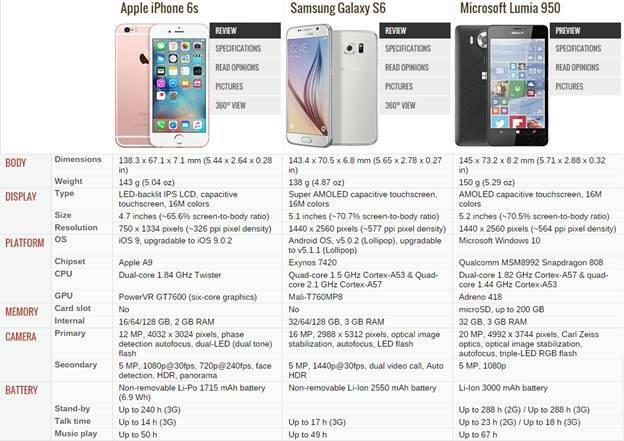 For more information on the specifications, pricing, technical details of iPhone 6 - you can refer to the chart below or check out this page . Here is a review on our website on iPhone 6.
iPhone 7 - Features, specifications & more! iPhone 7: - It hasn't been long since the iPhone 6s was released, but the rumor mill has started to churn out pretty interesting stuff about Apple's new smartphone which might get dubbed as iPhone 7. iPhone 7 as according to various sources on the internet might feature a whole new design, with the usual upgrades of better processor, better camera and more RAM, this new iPhone is also said to be dust and water proof, which means Apple might go with some other material than their signature Aluminum. Some more rumors suggest that Apple might bring back the smaller sized phone in the name of iPhone 7 because of the fans demand. iPhone 7 might also do away with the home button integrating the Touch ID module right beneath the screen glass along with an edge to edge or even a curved edge display. Fall 2016 is long way but I guess it will be worth the wait if the rumors are to be believed.